A vehicle collision has caused traffic on the A259 in Pevensey. 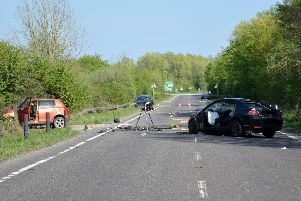 The emergency services were at the scene of the collision, which happened on the A259 Eastbourne Road in Pevensey Bay, Pevensey, at around 3.45pm this afternoon. The road was partially blocked, with police marshalling traffic and paramedics at the scene. A recovery vehicle came to the scene to retrieve a car involved in the collision.